A few months ago, I found this video on YouTube about discovering Uganda. By the time the video was done, I was awestruck. Amazed by the beauty, I binge-watched all the videos that were available in two days! It is amazing the beauty that this country has and we don’t even know. In one of the episodes, there was this lodge where all the structures were built with smooth river stones. I personally think that is a neat idea and absolutely creative not to mention environmental friendly. So, in that episode, they served dinner to the host and there was this butternut squash soup. As I watched the chef do his magic, that squash soup called out to my soul. And I was thinking: I have to make this squash/pumpkin soup ASAP. Does that happen to you? When you see a show (cooking particularly) and you just feel the need to be doing something related. 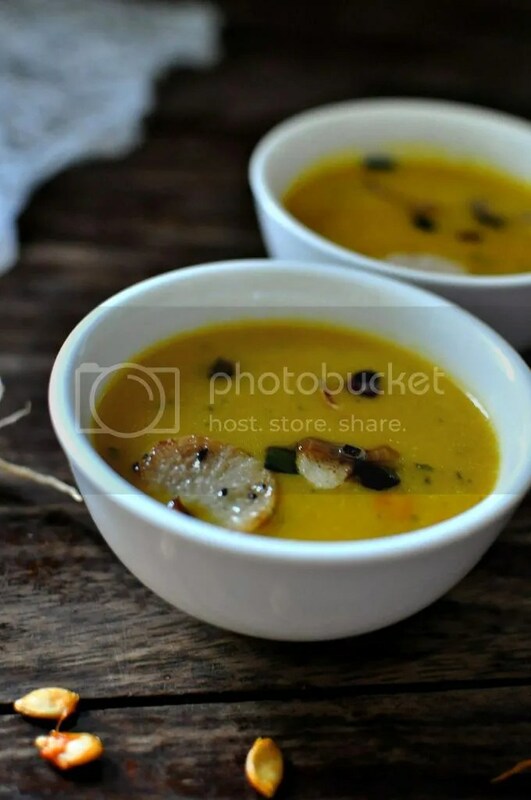 It was after many trials that this soup materialized with the perfect blend of flavors and textures. Instead of butternut squash, I used a pumpkin because I am yet to find out the difference between the two. Use a mature firm pumpkin. Mature pumpkins have hard covers which will need to be discarded. But if they are soft and tender, they can be blended. If you don’t have a blender, use a glass to mash the pumpkin while adding milk so that you can get a smooth consistency. For better results, you will need to use full cream milk. I recommend the Jesa brand. For your desired consistency, you will need less or more milk. Wash pumpkin and cut it into squares. On high heat, put the pumpkin pieces with water in a pan and bring to a boil. Remove from fire once pumpkin is tender and a fork can go right through the pieces. Drain water and let them cool. Chop the tomatoes, crushed garlic, and onions. Using a large spoon, scrape the pumpkin out if its cover. Measure three cups of pumpkin flesh and then put them in a blender.Add the milk and blend till smooth. In a sauce pan, add two tablespoons of oil. Add the garlic, ginger and salt and stir till slightly browned. Add onions and tomatoes and keep stirring till tomatoes are soft. Add curry powder and stir well. Next add the pureed pumpkin and stir well. Keep adding a little water while stirring until you reach your desired consistency. Sprinkle in a generous amount of black pepper and chili flakes. Let the soup boil for 10 minutes. Remove from fire. For the garnish: Thinly slice radish. Thinly chop a garlic clove. On high heat, put a teaspoon of oil in a pan. Add the radish and garlic and let one side of the thinly sliced radish brown while the garlic darkens. Sprinkle with salt. Remove from fire and add to the soup just before serving. I personally think that the show is amazing because it showcases beauty that we sometimes take for granted. 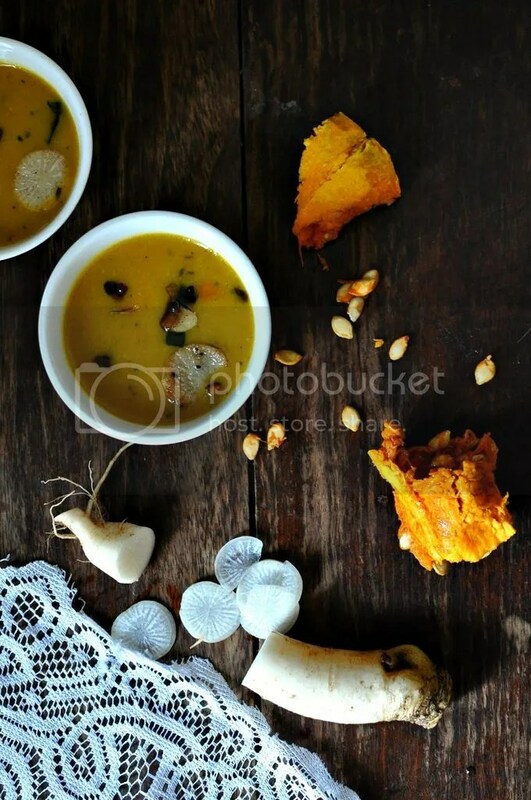 As I add visiting these amazing places to my bucket list and day-dream, I will be enjoying this pumpkin soup.. Join me! i love the soup tho it taste good if you add some traditional veges like isageek,you would lick your hand. I totally agree! That is the beauty of cooking, you can always add anything. Thanks! Let me know how it turns out when you try it. These pictures are so gorgeous! 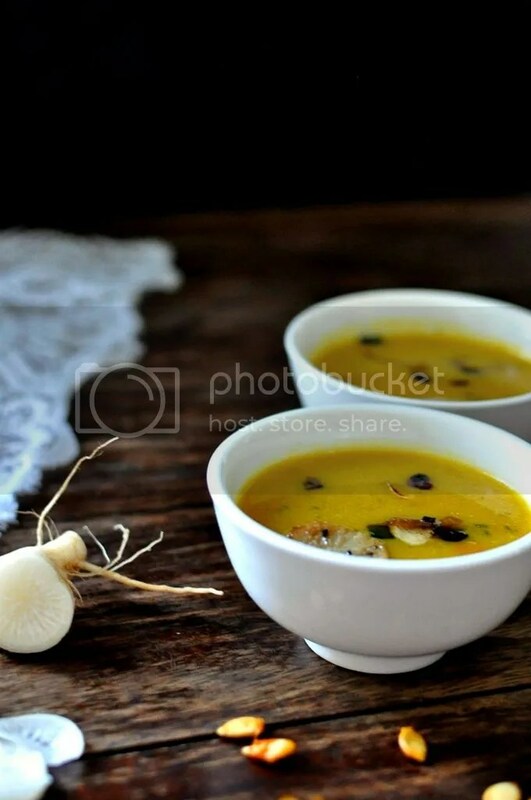 I love a good squash soup and these sound incredible! That video is really neat too, the stone houses are so interesting, really eco-friendly and perfect for its location by the river! Thanks for dropping by! The lodge is truly captivating! Nice to be here and especially to meet you. Bravo! This is DOPE!!! Definitely following. The foodie in me is squealing with delight! PS: From one natural hair sister to another, your hair is luscious! Mimi, thank you for stopping by. And thank you for that natural hair compliment. I would love to see yours too.